Denver! There is so much going on this week, you may want to try and clone yourself to be able to participate in all of the fun. This list is not even all of it, but my fingers have turned to bloody stumps and I must rest them awhile. Godspeed. This First Friday visit YOUR community access television station for an intimate studio performance by Eef and the Blues Express. Long-time DOM partner KGNU will be also be celebrating their 10th anniversary on-air in Denver and there will be FREE food and drinks, sponsored by Illegal Pete’s. This event is FREE and open to the public. An art sale/swap set to the beats of 80s and 90s hip-hop. FREE entry and FREE beer! Denver! You’ve already hit up a handful of First Friday events and are just buzzed up enough to start dancing…now what? 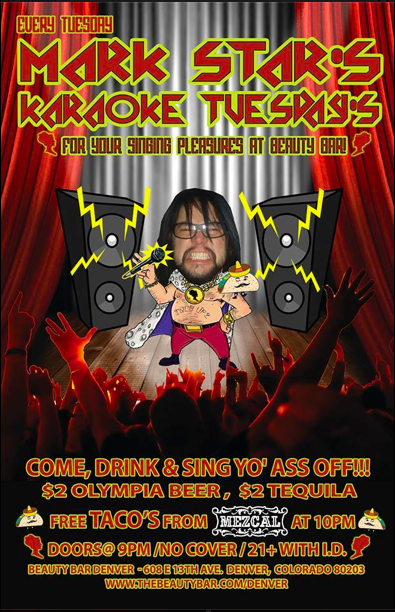 Cue Guilty Pleasures – a party dedicated to cheesy awesome dance jams, which is one of my personal favorites. When in doubt, grind it out. $5 suggested donation. The FREE party continues tonight with a last-minute switcheroo! Tonight, The Fine Gentleman’s Club will be presenting the first-ever Denver Comedy Funderdome. Teams of comics will compete for glory against the FGC in events that test both body and spirit! With a special Comics Against Civility segment hosted by Zac Maas and Jake Browne! Dance party to follow! Looking for an open-hearted, neighborly farmer’s market with a friendly atmosphere and a variety of vendors and activities? Look no further than the Highland Farmer’s Market! Marking its sixth year, this market offers local, fresh farm produce, preserved and ready-made foods, baked goods, cheeses, gourmet oils and magnificent, garden-fresh cut flowers. Not to mention, a mimosa garden and an exceptional mix of merchants lining the street! The ideal place to grab a bite, or get encouraged to whip up a new recipe, listen to live music, participate in children’s activities, and unite with the community. Bring your own bag(s) if possible! FREE. Take the plunge with hundreds of four legged swimmers living it up, splashing, and smiling in the last of the summer sun! Throughout the day, attendees can enjoy food trucks, family activities, and more! Registration is required to participate; tickets cost $15 and cover one dog and two people. This event benefits Freedom Service Dogs. Tour de Fat is a great way to celebrate the summer, complete with costumes, bikes, music, performers, contests, and beer. The event kicks off with a costumed bicycle parade that winds through city streets, starting and ending in City Park. Throughout the day, attendees can ride funky bikes in the bike corral, eat delicious fare, sample new and classic favorites from New Belgium, and participate in games and activities such as the “Thousand Person Dance Contest,” which will determine the winner of a 2014 New Belgium cruiser bike. No bike? No problem! Tour de Fat is partnering with Denver B-cycle to provide bikes to participants who are missing some wheels. This daylong event is FREE, yet all donations and proceeds from beer and merchandise sales will go to Bike Denver and The Denver Cruisers. View the event schedule here. The Sunnyside Music Festival provides music, fun entertainment, local food, lots of beer, and kids activities to the greater Sunnyside neighborhood of Northwest Denver via an inclusive all-day FREE music festival in Chaffee Park. View this year’s line-up here. This Saturday, find the time to come celebrate the TheBigWonderful, Denver’s newest pop-up food festival/farmers market/craft beer tasting/urban farm. This weekly community festival is focused on local tastes, local beers/booze (check-out this cool pop-up bar! ), and local music. Admission is FREE and it’s the perfect place to try new flavors with family and friends. Plus! This week enjoy live performances by Sunboy, Haircult, Prismwaves, Wild High, and an electro/swing dance party with Swingin’ Denver! Your first beer is FREE if you RSVP. The Dikeou Family Workshops are a great way for people of all ages to learn more about contemporary art and experiment with new creative processes. This month’s workshop will focus on New York artist Anya Kielar’s sand face assemblages. Kielar constructs her large sand faces by attaching found objects to masonite board. She then paints each part of the face in a different color and covers the paint with colored, sparkling sand to match the paint. For this project, participants will construct their own sand faces in a similar fashion utilizing found objects, paint, glittering sand, and masonite boards. This workshop is FREE to attend and no RSVP is required; drop-in anytime to participate. Light refreshments will be provided. The FREE party continues today with dodgeball, kickball, FREE food, and FREE beer. Uniting old world craftsmanship and refined tailoring with modern innovations in textiles and a rock-n-roll sensibility, John Varvatos has been a legend in the menswear industry since 2000. Shop the collection exclusively at Goldyn – just in time for fall! Plus! Check-out the exclusive John Varvatos X Goldyn Spotify playlist to get you in the rocker mindset before the event. Cocktail reception with DJ Tyler Snow from 6 – 8pm; shop from 12 – 8pm. FREE. After only three months of operations, the owners of the family-run Denver Pearl Brewing Company, located on South Pearl Street in Denver, will change their name to avoid legal action. The re-branded brewery will open this Saturday from noon until midnight, with a celebratory “re-naming party”, featuring new beers, special barrel-aged releases, and prizes to mark the occasion. Beers will be $1 at 12pm, $2 at 1pm, $3 at 2pm, and $4 from 3pm to 12am. Plus there will be FREE T-Shirts for the first 50 people! Start the fall season with some new skills. Come join the Freyja Project for this two-hour transformational workshop, where participants will discover simple steps to makeover their lives and households. Leanna Long, certified Family Life Coach and Holly Northup, Professional Organizer, will help participants organize every area of their lives to clear the clutter from their mind, body, spirit, and space. Participants will learn feel-good ways to reduce stress, create more space, and connect more consistently with their families. And as a bonus to the workshop, participants will also receive a take home checklist to help implement changes and 20% off of Family Coaching and Professional Organizing services. This course costs $30 in advance, or $35 at the door. There are about 40 tool lending libraries currently in the United States but none of them are in Denver. Therefore the Denver Tool Library wants to fix that! (Get it? It’s a tool joke.) Their mission is simple: to put tools in the hands of inspired DIY makers like YOU. Come on out to celebrate their launch and their first-ever tool drive! FREE beer (21+only), live music, and membership giveaways. Pie Bird will also be on-hand serving sweet and savory pies! $10 entry fee or an awesome tool donation for the future Denver Tool Library. 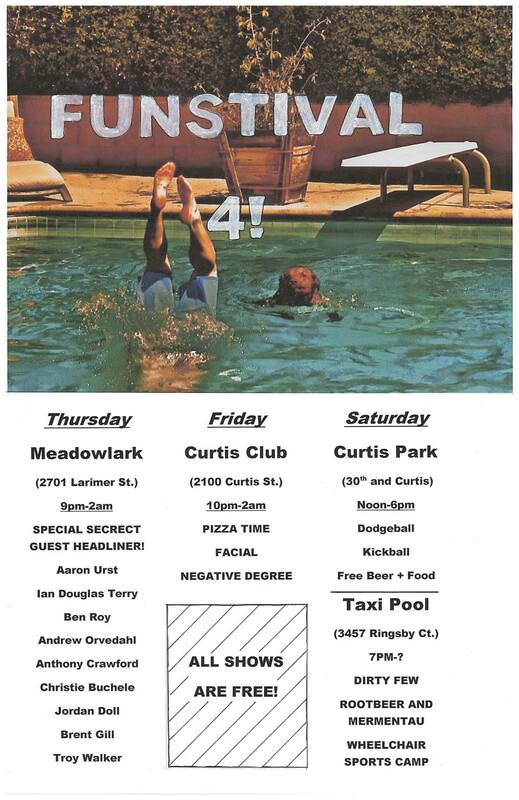 The FREE party continues with performances by Wheelchair Sports Camp, Rootbeer and Mermentau, and Dirty Few. FREE. It’s been six years of the Mile High Soul Club and they are itching to celebrate! Soul Daddies Tyler Jacobson, Dogboy, and Steve Cervantes will be spinning all killer, no filler tunes all night long. Free before 10pm; $3 after. Barbara Kopple’s stunning (and Oscar-winning) documentary gets inside a bitter coal miners’ strike in the heart of Appalachia. This is an essential American film and tickets are only $1. Join the Art Students League of Denver and The Denver Film Society for a special one-night screening of the documentary !Women Art Revolution, to fund adult scholarships for women students. Tickets cost $18 – $20. The Greater Than Social Club is THE place to be on the second Tuesday of every month. Combining music and comedy in Lannie’s basement cabaret setting, this event will make you straight-up pumped to be a Denverite. This month’s line-up includes comedy by Bobby Crane and Adrian Mesa, music by Dragondeer and Natalie Tate, with hosting services provided by Kristin Rand. Annnnnnnd, the entire show will be over by 10pm, so quit your hemming and hawing and just buy a ticket already, geez. $5; all ages. Come eat lunch and learn about the work of two tenants of the Posner Center for International Development, Africa Development Promise and One Acre Fund. Lunch will be provided but a $5 donation is appreciated. This event is open to the public; RSVP today. The Creative Collective is a professional networking collaborative for the creative industry, focused on sharing innovative ideas and making valuable connections. And Diebolt Brewing Company will donate 10 percent of the proceeds to the Colorado Business Committee for the Arts (CBCA). Colorado Business Committee for the Arts works to advance Colorado’s creative economy by connecting business and the arts. This event is FREE, but please RSVP. Join Denver Urban Gardens for their Horse Barn Farmers Market! Featuring produce sourced from local farms such as DeLaney Community Farm and The Growhaus, they are excited to offer a selection of fresh, local produce. The market is able to accept credit cards, cash, and SNAP benefits, as well as offer double value SNAP benefits, where $1 of SNAP equals $2 of vegetables and fruits. Celebrate 125 years of the Denver Public Library, and look to the future with the launch of Volume Denver, the Library’s new online collection of local music. Enjoy live music, beer samples from local brewers, birthday cupcakes from Cake Crumbs Bakery, and a sampling of Denver’s best food trucks. Ian Cooke, Pure Fiction and Plat Maravich will be performing! Individual tickets cost $30. Proceeds benefit the Denver Public Library. Come on out for an eclectic night of short films by Johnny Morehouse, featuring works that range from narrative, to documentary, to experimental. Kicking off the night is the wonderfully talented Phil Norman on Cello. Only 5 bucks.